Taco Bell has enlisted a small army of men to spruik its new breakfast menu – and they all happen to be named Ronald McDonald. It’s the fast-food chain’s biggest menu rollout to date and its biggest marketing campaign in its 50-plus year history. The TV spots central to the campaign are a blatant poke at McDonald’s, without an actual mention of the category kingpin. 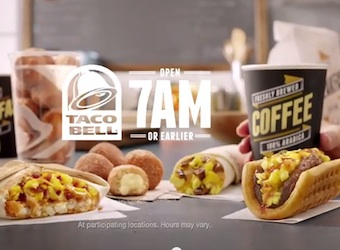 “It’s not surprising these guys are loving Taco Bell’s new Waffle Taco,” says the voice-over in one ad. “What is surprising is who they are.” Then the Ronald McDonalds introduce themselves. The commercials were created by Interpublic’s Deutsch, Los Angeles, and began airing in the US on 27 March. The spots include a disclaimer that the Ronald McDonalds in the spots are not affiliated with McDonald’s Corp in any way and were individually selected as paid endorsers of Taco Bell breakfast.